Our guide on starting a notary business covers all the essential information to help you decide if this business is a good match for you. Learn about the day-to-day activities of a notary business owner, the typical target market, growth potential, startup costs, legal considerations, and more! What happens during a typical day at a notary business? When not notarizing documents for clients, business owners spend their time networking and implementing ideas defined in their marketing strategy. Mobile business owners spend a portion of each day traveling to meet their customer’s needs. Notary businesses are cautioned against pigeonholing themselves into serving just one type of client. 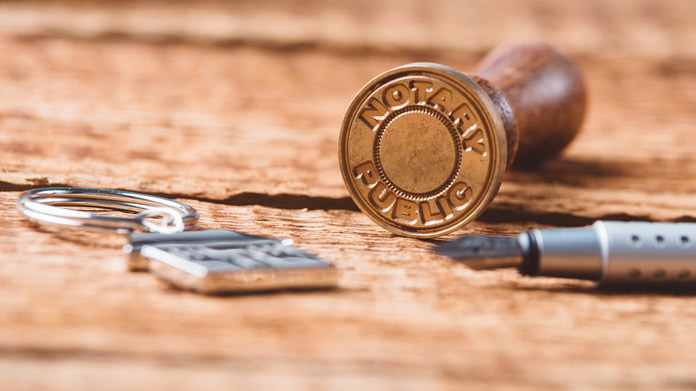 There are a number of different types of documents that require a notary; it is recommended that you target as many as possible when marketing to the public. How does a notary business make money? A notary business charges a fee for each document they notarize. Building a relationship with organizations that require a notary regularly is a great way to ensure a steady flow of income. What is the growth potential for a notary business? Before opening your business, research other notary services in the area. Is there a demand for it? What other services do they offer? What hours are they available? Is your area in need of a mobile service? How many online notaries are available in your state? Tailor your services and hours around what your community is lacking to ensure your company grows to meet your business goals. What are some skills and experiences that will help you build a successful notary business? Notary publics must complete a state training course and pass the state exam (specific rules vary from state to state). Once you have done so, you will need to mail your application in, along with a fee, to the state notary commission. Upon acceptance, you will swear the oath and purchase any required bonds. Some states also require a notary seal. The National notary Association (NNA) provides details regarding each state’s notary requirements, as well as real-life examples of situations you could be faced with in your public servant position. What are the costs involved in opening a notary business? Training and licensure fees range from $90 to $225, depending upon the state in which you reside and its specific requirements. Bonds average $125 and last the life of your certification, which is typically four years. In some cases, a notary mentor is required and may charge a fee for advising you. If this is the case, the NNA's LinkedIn discussion group is a great resource for finding a qualified mentor. If your vision includes a brick-and-mortar establishment, you will incur the standard expenses that come with leasing a building. If yours is a mobile business, be sure you have reliable transportation and the insurance required to do so. Regardless of which path you choose, a website should be included in your initial budget. A simple site should be sufficient, unless you wish to host an online notary business. Simple sites can be built for less than $1,000, while more complicated and secure websites can run $3,500 or above. What are the steps to start a notary business? Form a legal entity. Establishing a legal business entity prevents you from being personally liable if your notary business is sued. Open a business bank account. A dedicated checking account for your notary business keeps your finances organized and makes your business appear more professional to your customers. What are some insider tips for jump starting a notary business? Join a local or national notary association. Attend workshops. This membership will help you stay current on new laws, network within the community, and tweak your marketing strategy. Make yourself available when other notaries are not. After five, on weekends, and during holidays are the perfect times to land business your competition is missing out on. If you choose to have a physical location, make your business more profitable by offering additional services. Diversify - Look into the various notary specialties and expand your services to include as many as possible. Regardless of how you structure your business there are a number of affordable options for marketing your business. Social media is a great way to educate the public on the services you offer. Online directories such as Yelp are another option for ensuring consumers in your community are aware of your presence, location, fees, and hours. Additionally, associations such as The American Society of Notaries offer members free professional profiles. Once your marketing materials are printed, get out and network within the community. Visit local banks, mortgage companies, title companies, real estate offices, government offices, charitable organizations, and professional organizations, and notify them of your services. Attend small business events through your local Chamber of Commerce and community service enterprises. Building a referral base takes time, but is typically the foundation of every successful small business. Your focus should be on delivering quality and timely service to each and every customer you serve. Keep in mind that your job is to notarize private and sensitive documents. If word travels that you were anything but professional, your business could take a permanent hit. If you plan on having a physical location, there are a few questions you will need to consider: Do you want to be a notary or would you rather hire someone to take on that responsibility? What hours do you want the notary available? What other services do you plan to offer? Do you want to be in charge of the additional services or would you rather oversee the enterprise? In many cases, notary public business owners choose to start small, hiring more employees as the business grows. If this is the case, however, prepare yourself for long hours. Mobile and online notaries have a little more flexibility, as they do not have the added pressure of higher overhead costs. In this case, you could hire additional employees as the need arises. Before hiring anyone, check with your state to ensure they meet the notary guidelines. Certain state permits and licenses may be needed to operate a notary public business. Learn more about licensing requirements in your state by visiting SBA’s reference to state licenses and permits. A notary public business is generally run out of an office. Businesses operating out of a physical location typically require a Certificate of Occupancy (CO). A CO confirms that all building codes, zoning laws and government regulations have been met. Before leasing, confirm that your landlord has or can obtain a valid CO that is applicable to a notary public business. Review all building codes and zoning requirements for your business’ location to ensure your notary public business will be in compliance and able to obtain a CO. This depends upon what type of document you are signing and who your client is. Banks and credit unions often make their notary services available to customers free of charge, while you might charge $5-$10 for the same service. Loan signing agents earn $75 to $200 per appointment. What are the ongoing expenses for a notary business? If you decide to open a brick-and-mortar business, budget for the standard overhead expenses that come with leasing an office. How much profit can a notary business make? Once you have built a referral base and are getting regular signings each week, the business can be very profitable. Full-time notary signing agents work an average of forty to forty-five hours a week, including driving to appointments. This works out to fifteen signings per month. If your fee is $100 per signing, you will bring in an average of $6,000 per month or $78,000 annually. Since your overhead is low, much of those earnings turn into profit. To maximize profits, carefully consider your fee structure and payroll costs before bringing on another team member.